Background: Chronic bronchiolitis is the most important problems of chemical victims of mustard gas. Diverse studies suggest that substance P (SP) as a member of tachykinin neuropeptides, has a significant role in the neurogenic inflammation processes of the airways and lungs. We aimed to determine the serum level of SP in chemical victims of mustard gas and compare it with normal subjects. Materials and Methods: The chemical victims were divided into the 2 groups of 30:A group with mild to moderate pulmonary symptoms and other group with moderate to severe symptoms and compared with 3 rd group as healthy controls. After preparing our samples and using the SP kit, final analysis was performed with enzyme-linked immunosorbent assay reader. Results: The Concentration of circulatory SP levels in the chemical patients was 2.86 ± 1.47 ng/ml and had not a significant difference with the control group (3.15 ± 1.03 ng/ml) (P > 0.05). The circulatory SP levels were 2.48 ± 0.92 ng/ml and 3.28 ± 1.73 ng/ml in patients with moderate to severe symptoms and mild to moderates (P < 0.05) respectively. Conclusion: The SP may have a role in pulmonary complications of mustard gas. The lower level of SP in the moderate to severe patients may be due to corticosteroid consumption in such severe cases. However, further studies are needed to clarify the roles and mechanism of SP in this setting. Chronic pulmonary complications are the most complaint of the chemical victims of mustard gas who were exposed to sulfur mustard by Iraqis during Iran-Iraq war. In a study in guinea-pigs was shown that sulfur mustard (SM) intoxication induces airway muscle hyper responsiveness to SP by reducing tracheal epithelial neutral endopeptidase activity and that glucocorticoids might inhibit this hyper responsiveness by increasing this activity. Few previous studies are on skin lesions  and response to SP in animal fields. However, in human, the main pulmonary consequence of mustard gas is isolated bronchiolitis obliterans, ,,, and the serum level of SP in such disorder has not been evaluated. For the first time, we aimed to study the relation between SP serum level and bronchiolitis obliterans in chemical victims. We carried a historical cohort study on the chemical victims of mustard gas with pulmonary symptoms after taking a written agreement from them in Baqiyatallah hospital. Based on the "Global Initiative for Chronic Lung Diseases" guidelines, disease severity was categorized into mild, moderate and severe categories. We divided our cases into 3 groups of 30; the group 1 with mild to moderate pulmonary symptoms, the group 2 with moderate to severe pulmonary symptoms and the group 3 with normal subjects as a control group. The inclusion criteria were as follows: History of exposure to mustard gas, pulmonary problems in physical exam and pulmonary function testing (PFT), Age range is 20-70 years, voluntary participation. The study design was approved by Ethic board of Baqiyatallah University of Medical Sciences, Tehran, Iran. Written consent form was obtained from all participants. The bronchogenic carcinoma, pneumonia or bacterial bronchitis in the recent month, cigarette smoking and addiction to other opioids were considered as exclusion criteria. After routine physical examination and pulmonary function test, blood samples were taken with heparinized syringe and then centrifuged them. Blood samples were centrifuged within 30 min at 4°C at 3,000 g for 10 min. Serum samples were stored at −80°C in the 1 ml tube until performance of the assay. SP level was measured by competitive enzyme immunoassay (SP Enzyme Immunoassay kit; Cayman Chemical; Ann Arbor, MI) with a working range of 3.9-500 pg/ml, typically with an IC 50 (50% B/B 0 ) of ~30 pg/ml and IC 80 (80% B/B 0 ) of ~8 pg/ml. The analysis was completed with enzyme-linked immunosorbent assay reader in the wave length of 405 nm (with reference of 620 nm). All our data were analyzed by using the SPSS software version 13. Altogether, 60 chemical patients, which 30 of them had mild to moderate pulmonary symptoms and 30 of them had moderate to severe pulmonary symptoms, and also 30 people as a control group was studied. The mean ± SD of SP concentration was 2.86 ± 1.47 and 3.15 ± 1.03 pg/ml in chemical exposed patients and the control group, respectively. There was no significant difference concerning SP concentration in the chemical exposed patients and the control group [P = 0.38; [Figure 1]. Furthermore, the study of chemical exposed patients with moderate to severe symptoms revealed that SP mean concentration (2.48 ± 0.92 pg/ml) was significantly lower than serum concentration in patients with mild to moderate symptom (3.28 ± 1.73 pg/ml) and the control group (3.15 ± 1.03 pg/ml). (P = 0.003). The [Figure 2] shows the differences. We found that the mean serum level of SP in the chemical victims had never significant difference with the control group. 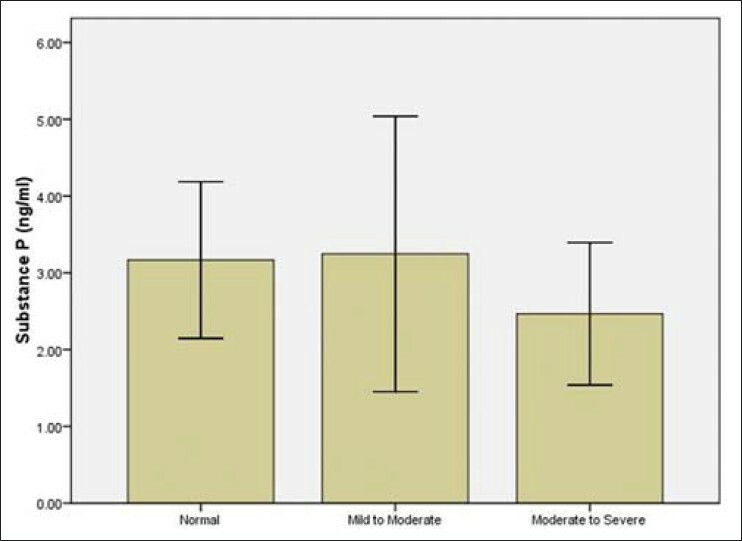 However, the mean serum level of SP in moderate to severe patients was significantly lower than mild to moderate patients, but there was no significant difference between the mild to moderate patients and the control group. Grissell et al. showed that reduced SP gene expression is associated with bacterial colonization in the kid's airways, which indicates the anti-bacterial role of SP. De Vries et al. study on the guinea-pigs revealed that SP is a notable agent in the induction of airways hyper responsiveness in the inflammation process of asthma. The latter animal study suggests that SP likely makes this effect by mediation of nerve growth factor (NGF). The NGF can be a new target for future studies on these victims. However, our moderate to severe patients were treated with corticosteroids during the study and it was ethically impossible to avoid drugs consumption. As a result, the anti-inflammatory effects of corticosteroid drugs could lead to decline SP serum level in these patients. In a study by Semple et al. on 197 infants admitted to hospital with human respiratory syncytial virus bronchiolitis they found that severe bronchiolitis in infants was associated with reduced airway interferon gamma and SP. Consequently, lower SP levels can explain our finding in these patients because one of the main complications of chemical victims is severe bronchiolitis. ,,, In addition, it can be assumed that mustard gas exposure could induce some mediators that ablate sensory fibers, which produce SP in lung tissue. There were not considerable differences in SP levels between chemical exposed patients and healthy controls. The exact mechanism(s) is not clear; however, corticosteroids consumption may cause lower SP concentration in victims with severe symptoms than the mild ones. Evaluation of this hypothesis will need to broad human and also animal studies in the future. 1. Advenier C, Joos G, Molimard M, Lagente V, Pauwels R. Role of tachykinins as contractile agonists of human airways in asthma. Clin Exp Allergy 1999;29:579-84. 2. Colten HR, Krause JE. Pulmonary inflammation: A balancing act. N Engl J Med 1997;336:1094-6. 3. Maggi CA. The effects of tachykinins on inflammatory and immune cells. Regul Pept 1997;70:75-90. 4. Suzuki R, Furuno T, McKay DM, Wolvers D, Teshima R, Nakanishi M, et al. Direct neurite-mast cell communication in vitro occurs via the neuropeptide substance P. J Immunol 1999;163:2410-5. 5. Germonpre PR, Bullock GR, Lambrecht BN, Van De Velde V, Luyten WH, Joos GF, et al. Presence of substance P and neurokinin 1 receptors in human sputum macrophages and U-937 cells. Eur Respir J 1999;14:776-82. 6. Joos GF, Van Schoor J, Kips JC, Pauwels RA. The effect of inhaled FK224, a tachykinin NK-1 and NK-2 receptor antagonist, on neurokinin A-induced bronchoconstriction in asthmatics. Am J Respir Crit Care Med 1996;153:1781-4. 7. DeRose V, Robbins RA, Snider RM, Spurzem JR, Thiele GM, Rennard SI, et al. Substance P increases neutrophil adhesion to bronchial epithelial cells. J Immunol 1994;152:1339-46. 8. Lundberg JM. Pharmacology of cotransmission in the autonomic nervous system: Integrative aspects on amines, neuropeptides, adenosine triphosphate, amino acids and nitric oxide. Pharmacol Rev 1996;48:113-78. 9. Hornby PJ. Central neurocircuitry associated with emesis. Am J Med 2001;111 Suppl 8A: 106S-12. 10. Park TJ, Comer C, Carol A, Lu Y, Hong HS, Rice FL. Somatosensory organization and behavior in naked mole-rats: II. Peripheral structures, innervation, and selective lack of neuropeptides associated with thermoregulation and pain. J Comp Neurol 2003;465:104-20. 11. Tian L, Cai L, Kang J. Elevated substance P content in sputum and plasma in patients with COPD and its relationship with FEV1/FVC. Zhonghua Jie He He Hu Xi Za Zhi 2000;23:138-40. 12. Ghanei M, Harandi AA. Long term consequences from exposure to sulfur mustard: A review. Inhal Toxicol 2007;19:451-6. 13. Calvet JH, D'Ortho MP, Jarreau PH, Levame M, Harf A, Macquin-Mavier I. Glucocorticoids inhibit sulfur mustard-induced airway muscle hyperresponsiveness to substance P. J Appl Physiol 1994;77:2325-32. 14. 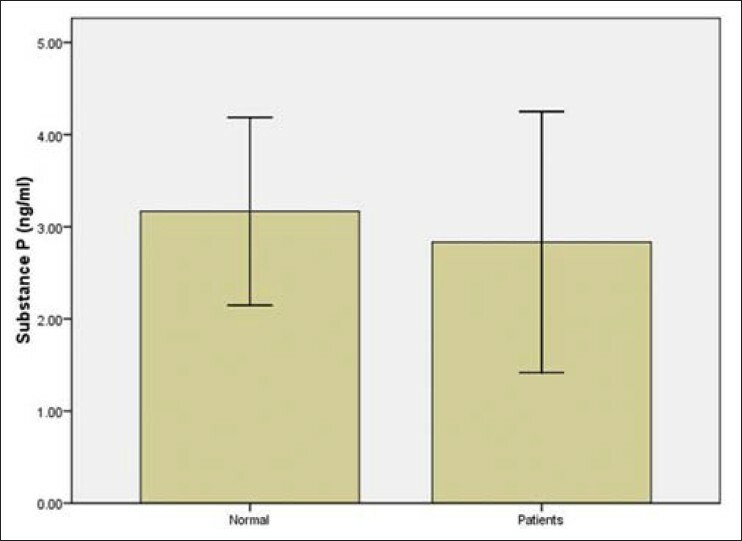 Panahi Y, Taherzadeh ES, Davoudi SM, Sahebkar A, Ranjbar R. Investigation of serum substance P status in patients with chronic pruritic skin lesions due to sulfur mustard: A cross-sectional study. Cutan Ocul Toxicol 2013;32:4-8. 15. Ghanei M, Harandi AA. Molecular and cellular mechanism of lung injuries due to exposure to sulfur mustard: A review. Inhal Toxicol 2011;23:363-71. 16. Ghanei M, Tazelaar HD, Chilosi M, Harandi AA, Peyman M, Akbari HM, et al. An international collaborative pathologic study of surgical lung biopsies from mustard gas-exposed patients. Respir Med 2008;102:825-30. 17. Thomason JW, Rice TW, Milstone AP. Bronchiolitis obliterans in a survivor of a chemical weapons attack. JAMA 2003;290:598-9. 18. Ghanei M, Harandi AA, Tazelaar HD. Isolated bronchiolitis obliterans: High incidence and diagnosis following terrorist attacks. Inhal Toxicol 2012;24:340-1. 19. Pauwels RA, Buist AS, Calverley PM, Jenkins CR, Hurd SS, GOLD Scientific Committee. Global strategy for the diagnosis, management, and prevention of chronic obstructive pulmonary disease. NHLBI/WHO Global Initiative for Chronic Obstructive Lung Disease (GOLD) Workshop summary. Am J Respir Crit Care Med 2001;163:1256-76. 20. Bhatia M, Zhi L, Zhang H, Ng SW, Moore PK. Role of substance P in hydrogen sulfide-induced pulmonary inflammation in mice. Am J Physiol Lung Cell Mol Physiol 2006;291:L896-904. 21. Kodavanti UP, Schladweiler MC, Ledbetter AD, Ortuno RV, Suffia M, Evansky P, et al. The spontaneously hypertensive rat: An experimental model of sulfur dioxide-induced airways disease. Toxicol Sci 2006;94:193-205. 22. Tomaki M, Ichinose M, Miura M, Hirayama Y, Yamauchi H, Nakajima N, et al. Elevated substance P content in induced sputum from patients with asthma and patients with chronic bronchitis. Am J Respir Crit Care Med 1995;151:613-7. 23. Pujol JL, Bousquet J, Grenier J, Michel F, Godard P, Chanez P, et al. Substance P activation of bronchoalveolar macrophages from asthmatic patients and normal subjects. Clin Exp Allergy 1989;19:625-8. 24. Grissell TV, Chang AB, Gibson PG. Reduced toll-like receptor 4 and substance P gene expression is associated with airway bacterial colonization in children. Pediatr Pulmonol 2007;42:380-5. 25. de Vries A, Engels F, Henricks PA, Leusink-Muis T, McGregor GP, Braun A, et al. Airway hyper-responsiveness in allergic asthma in guinea-pigs is mediated by nerve growth factor via the induction of substance P: A potential role for trkA. Clin Exp Allergy 2006;36:1192-200. 26. Lundberg JM, Saria A. Capsaicin-induced desensitization of airway mucosa to cigarette smoke, mechanical and chemical irritants. Nature 1983;302:251-3. 27. Semple MG, Dankert HM, Ebrahimi B, Correia JB, Booth JA, Stewart JP, et al. Severe respiratory syncytial virus bronchiolitis in infants is associated with reduced airway interferon gamma and substance P. PLoS One 2007;2:e1038. 28. Ghanei M, Chilosi M, Mohammad Hosseini Akbari H, Motiei-Langroudi R, Harandi AA, Shamsaei H, et al. Use of immunohistochemistry techniques in patients exposed to sulphur mustard gas. Patholog Res Int 2011;2011:659603.